Note Ph.D. defence transposed into English, to introduce my previous work in France for the members of my team. Boutin, O.D.M. (2010, January). 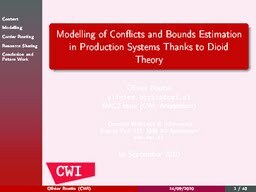 Modelling of Conflicts and Bounds Estimation in Production Systems Thanks to Dioid Theory.